Including Poe's most terrifying, grotesque and haunting short stories, Tales of Mystery and Imagination is the ultimate collection of the infamous author's macabre works. For me, Poe’s short stories are incredibly hit or miss; I’m unsure whether or not that’s a particularly unusual opinion. I read The Tell-Tale Heart a few years ago and was enthralled. I read The Murders in the Rue Morgue last year and was utterly unimpressed with Poe’s detective stories. My experience of both his detective and horror offerings led me to believe I preferred his horror. 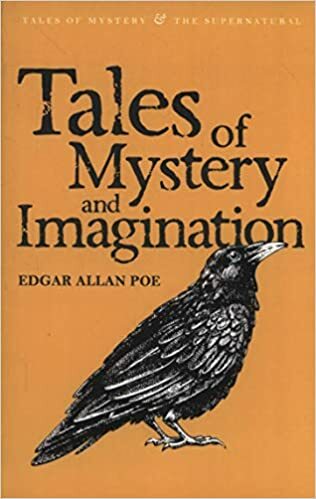 Picking up Tales of Mystery and Imagination has confirmed Poe is simply hit or miss with all stories - there’s no criteria for this. There were six tales in this collection, and as two of these were included in The Murders in the Rue Morgue, mentioned above, I read only four - The Gold-Bug, The Oblong Box, The Fall of the House of Usher, and The Pit and the Pendulum. With the exception of The Pit and the Pendulum (the less commentary I provide on this one, the better, I just can’t), I was very taken with these stories. Poe lends an unbridled tension to his narrative, ensuring a quickening of the heartbeat and an ability to tear your eyes away from the page. The Fall of the House of Usher was particularly impressive in this regard; there is just something about a gothic tone such as this which completely chills my blood. It was delicious. Although The Gold-Bug and The Oblong Box weren’t necessarily spooky or gothic, they contained delectable mysteries to solve, each of which had their own hints of the macabre. Poe clearly displays his genius here with impressive deductions and thrilling twists. This collection has made me excited about Poe again, which is an utter blessing as I have more of him creeping up my reading list. His ability to create such intense and spectacular feelings of unease in a reader is a rare skill, and his mastery of strangeness completely iconic.